In another act of Trump jujitsu, President Trump has turned the tables on the Democrats and open borders RINOs by signing an Executive Order restating the Administration’s intention to “rigorously enforce our immigration laws” while affording Congress an opportunity to address family separation. Saying it is “It is unfortunate that Congress's failure to act and court orders have put the Administration in the position of separating alien families to effectively enforce the law.” The Executive Order stated that it is the policy of this Administration to maintain family unity, including by detaining alien families together where appropriate and consistent with law and available resources. The President also directed the Attorney General to take the necessary legal steps to address the root cause of the problem, which was a consent decrees in a 1997 immigration case. “The Attorney General shall promptly file a request with the U.S. District Court for the Central District of California to modify the Settlement Agreement in Flores v. Sessions, CV 85-4544 ("Flores settlement"), in a manner that would permit the Secretary, under present resource constraints, to detain alien families together throughout the pendency of criminal proceedings for improper entry or any removal or other immigration proceedings,” stated the Order. The President also directed the Attorney General, “to the extent practicable,” to prioritize the adjudication of cases involving detained families. The Executive Order, in addition to quashing the Left’s latest narrative to drive their push for open borders did two other important things. First, it flipped the PR hot potato of separating families at the border back to Congress, and to the Federal Courts, where it belongs. The President even poked Congress and its inactivity on border security with the title of the Executive Order: An EXECUTIVE ORDER AFFORDING CONGRESS AN OPPORTUNITY TO ADDRESS FAMILY SEPARATION. The Clinton-era “Flores settlement” largely defines how minors who enter the United States illegally are treated by the Immigration and Naturalization Service and it is a virtual get out of jail free card, even if the minor commits DUI, breaking and entering, auto theft or practically any other non-violent crime, so ordering the Attorney General to revisit that settlement may have a great deal of utility. 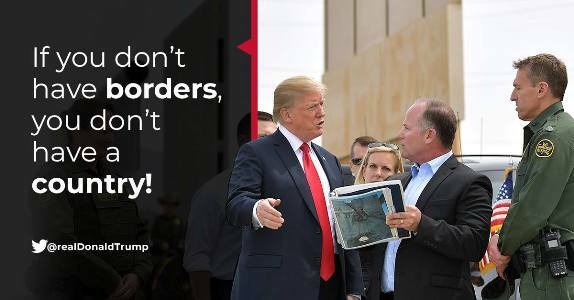 President Trump’s Executive Order also made it clear that the party with the constitutional responsibility for defining the United States’ policies on immigration, naturalization and border security is Congress, whose RINO leaders have been totally unwilling to take the steps necessary to secure our border and further discourage illegal border crossing. It is the policy of this Administration to rigorously enforce our immigration laws. Under our laws, the only legal way for an alien to enter this country is at a designated port of entry at an appropriate time. When an alien enters or attempts to enter the country anywhere else, that alien has committed at least the crime of improper entry and is subject to a fine or imprisonment under section 1325(a) of title 8, United States Code. This Administration will initiate proceedings to enforce this and other criminal provisions of the INA until and unless Congress directs otherwise. President Trump has defused the phony family separation crisis that the Left and their allies in the media and the cheap labor wing of the business community ginned-up to help them ram a Republican majority-destroying amnesty bill through Congress. What Republican congressional leaders don’t seem to understand (and maybe that’s because they are on the other side) is that how they deal with border security is going to define whether they remain the congressional majority or revert to the status of a powerless minority they held for most of the 60+ years between the New Deal and the Contract with America. Standing with President Trump for rigorous enforcement of our immigration laws and border security is the one hope Republicans have of winning the midterm election and remaining the majority party in Congress. The toll-free Capitol Switchboard is (1-866-220-0044) we urge CHQ readers and friends to call their Representative and Senators today to tell them to vote no on any bill that grants amnesty to illegal aliens and does not fulfill President Trump’s four pillars of immigration reform and border security. Submitted by sdofaz on Thu, 06/21/2018 - 11:03. I would add only one thing to the article. Do not forget the republicans are two different groups, the rinos and the conservatives. It is incumbent upon the voters this year and every year to oust the rinos from their seats as well as the dems and replace them with conservatives to keep the congress with Trump. We need to help remove the impediments to our MAGA and assist President Trump in every way we can now that we understand who the rinos are and that they are in reality an arm of the DNC not the GOP. View every incumbents voting record and there are many who will lie about their allegiance but their voting in congress will reveal their true positions.